Christmas Ornaments Made in USA - Cranberry Red Crystal Glass Three Inch Ornament Ball - A Christmas Ornament Co. This Cranberry Red-hued Christmas ornament was blown by hand by an old-world process involving the nearly-lost art of "free-hand" glass blowing. All the hand-made ornaments we offer are of heirloom quality and will undoubtedly last for generations. Discover the near-extinct art of glass-blowing with any of the hand-crafted ornaments we offer. 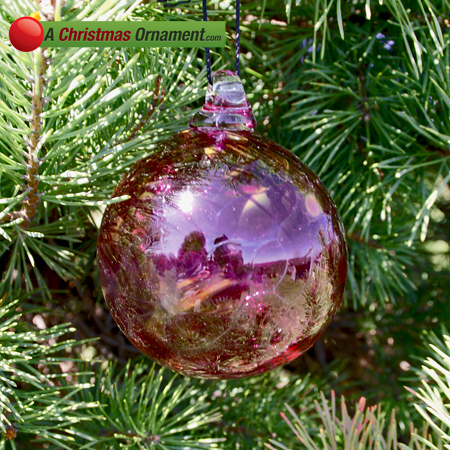 This ornament is made using the "free-blown" process (no mold). Would make a great gift for anyone. No two are identical. It would be very difficult to surpass this (and our other glass ornaments) level of quality. It can stay outdoors all year long - anywhere. If it falls to the earth most likely it will not break. This is very heavy glass. Crafted with pride in the U.S.A. Ornament measures 3 inches wide.